Central Tech’s Truck Driver Training (TDT) program prepares students as over-the-road drivers earning an average annual salary of $45,000 after 23 days of class and drive time. The TDT program uses the latest equipment and teaching techniques in the classroom and on the driving range to ensure graduates from the program are employable in the trucking industry. In fact, Central Tech’s current placement rate is 96%. With a ratio of only two students per truck, each student has the ability to develop proficient driving skills and average more than 44 hours of behind the wheel driving time. Central Tech’s driving range covers more than three miles of paved roadway and is fully equipped with traffic signs, railroad crossings and skill practice areas designed to help students become proficient in driving a tractor-trailer. On the driving range students learn straight/offset/90 degree backing, parallel parking, coupling/uncoupling, intensive pre-trip inspection, proper shifting techniques, and other skills. Central Tech’s TDT program has been helping students earn their Commercial Driver’s Licenses (Class A) since 1969, and is the only school in Oklahoma certified by the Professional Truck Driver Institute (PTDI), meeting strict and stringent industry standards. TDT classes begin every two weeks and run year round. Visit the TDT booth on the Drumright campus during the annual Central Tech Open House on Sunday, February 16 between 1-4pm to learn more about the Truck Driver Training program. For more information visit www.tdt-ok.com. 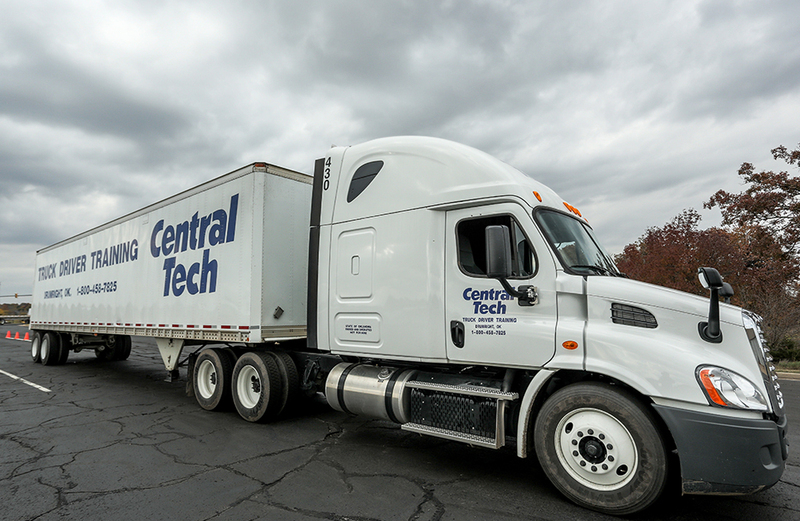 Central Tech’s Truck Driver Training (TDT) program prepares students as over-the-road drivers earning an average annual salary of $45,000 after 23 days of class and drive time. Central Tech’s TDT program has been helping students earn their Commercial Driver’s Licenses (Class A) since 1969, and is the only school in Oklahoma certified by the Professional Truck Driver Institute (PTDI), meeting strict and stringent industry standards. TDT classes begin every two weeks and run year round.